Feb 13, 2018—Businesses are being encouraged help support disabled people into employment opportunities by leading Hull companies and organisations. 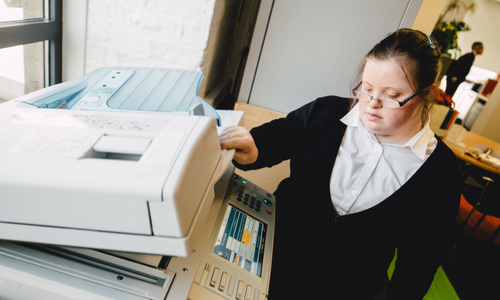 Lucy Dillon working at Humber LEP as part of the This-Ability programme to help people with disabilities get into full-time work. MPH Fulfilment and Humber LEP are two groups that have called on other employers to become involved in the This-Ability partnership, which helps employers to become “disability confident”. The national Disability Confident programme is a scheme designed to help employers recruit and retain disabled people and people with health conditions for their skills and talent. The partnership is run by Talent Match Humber in order to ensure employers are aware of the support available to take advantage of this rich untapped talent pool. Chantelle Snee, development officer for Talent Match Humber, says the organisation is working with employers to knock down barriers hindering some disabled people from working. “We started over a year ago and, since then, have been continuing to support employers taking on people with disabilities,” she said. “The fact is they want to access this huge pool of talent, but often have questions over any changes they may need to make. “We have found people going through Talent Match who are disabled and passing with flying colours, but when they are applying for jobs they are coming up against barriers. The Humber Local Enterprise Partnership took on Lucy Dillon for work experience as part of the scheme and said she proved a “valuable addition” to the team. Teresa Chalmers, executive director of employment and skills at Humber Local Enterprise Partnership (LEP), said: “The Humber LEP is delighted to be contributing to the This Ability campaign, which has gained such positive momentum in the Humber. “As part of our continued support for our young people, the LEP offers a range of work experience opportunities. One of these included a placement for Lucy, who proved a valuable addition to our skills team. MPH Fulfilment has employed a young person who suffers from mild autism and a mild learning disability, neither of which impact her ability, and the firm hopes many other businesses in the region follows its lead. Marc Henderson, MPH Fulfilment managing director, said: “It’s important to have understanding about what it means to be Disability Confident, Talent Match have shown me the way to go … you automatically think, ‘what do we have to do to ensure safety in the work environment?’ when really it’s just common sense. “Katie and Talent Match have taught me we don’t have to change a lot, we just have to be aware and have understanding. Registered office: Humber Learning Consortium, 63-71 Anlaby Road, Hull, East Yorkshire, HU3 2LL.